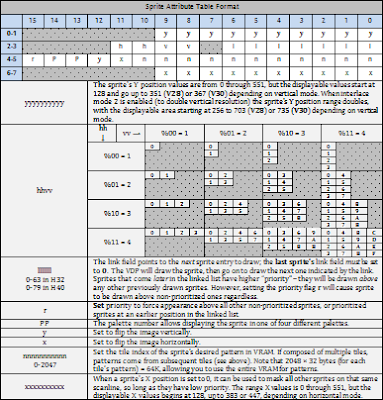 "The Ultimate M68K Cheat Sheet" is a document heavily influenced by MarkeyJester's work, who used a real Genesis to determine cycle counts for all M68K instructions with every source and destination operand possible. My ultimate cheat sheet attempts to do the same, but ultra-compacts the information into as few tables as possible (31 tables to be exact, covering 9 pages) and incorporates notes from the famous "68000.pdf" (author unknown) floating around, making the beginner's difficult journey to mastering the M68K a whole lot easier. To download my "ultimate" M68K cheat sheet, first donate $5 by using the button on the right, then click here. I've also taking a similar approach to programming the Genesis's VDP, by documenting different registers and techniques (such as DMA operations) into small, compact tables that take no more than 4 pages. 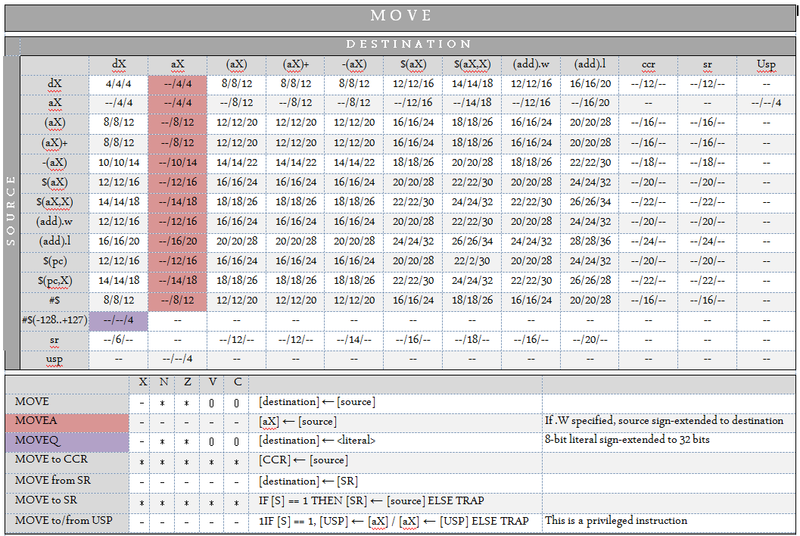 To download my "ultimate" Genesis VDP cheat sheet, first donate $5 by using the button on the right, then click here. Also, for practicing M68K assembly, I have been rewriting/improving existing decompression code found in Sonic the Hedgehog 1 (and apparently used by many other games such as Golden Axe), whose source is freely available. "Nemesis" is compression is used for compressing sprite and tile graphics. It does so by creating a library of "brushes", essentially color indices paired with repeat counts. The more common these occur, the shorter the opcode used to indicate them. Opcodes are packed together, making for little waste. You can read more about it here . To download my improved Nemesis decompression code for use with Sonic 1: click here. Kosinski decompression can be read about here. To download my improved Kosinski decompression code for use with Sonic 1: click here. 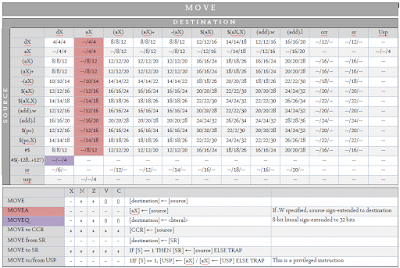 "Enigma" is used to compress backgrounds (collections of nametable attribute words). The entries are mainly compacted by encoding only those bits that the compression cares about (like declining to code for priority or x- or y-mirror bits, or just making the tile index use fewer bits than its maximum of 11). As usual, data is presented as a stream of bits, so there is little waste. PDF of box front & back with original artwork. Individual serial number, based on the order of purchase. Your personal information is encoded into the ROM, and can be traced back to you. Distribution of the ROM will decrease the likelihood of future ROM releases from Elektronite. The ROM requires additional software or hardware to play -- emulators such as Nostalgia or jzIntv, or devices such as the CC3 or Intellicart. Make a donation of at least $10 using the donate button on the right. Email carljr17@hotmail.com to let me know you want the ROM and also the name you would like used for the in-game credits (maximum 18 characters). I will send the personalized ROM to you, and all associated PDFs as listed above, to the email address you use to notify me. 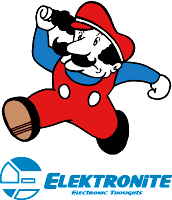 Classic Game Publishers, Inc. and Elektronite are not affiliated with Intellivision Productions, Inc. Rocks! in floating mode. Ship being chased by pulser and time detonated mine, released by green alien Rocks! in falling mode. Berzerker has just pulverized a large meteor. Ship recently destroyed the green alien. During Christmas vacation of 1999, I wrote a game which was inspired by Astrosmash! for the Mattel Intellivision, itself inspired by the classic Atari game "Asteroids". Rocks! has 6 progressively more difficult stages, 4 unique enemies, and two different modes of game play: "floating" in which your ship can move freely about and enemies come from all sides, and "falling" in which you are confined to left-right movement on the ground and enemies come from the top of the screen. This is a good example of my OOP graphics library I had developed in the early 90s, my recently acquired understanding of trigonometry and physics, my high-speed bitmap scaling and rotation routines, and a simple sound effects engine which works on three different sound cards (Adlib, SoundBlaster, and the Gravis Ultrasound). Rather than posting a download link to the file, you will post a link to this page instead. If you find the game educational or entertaining you will ( please) consider making a donation.